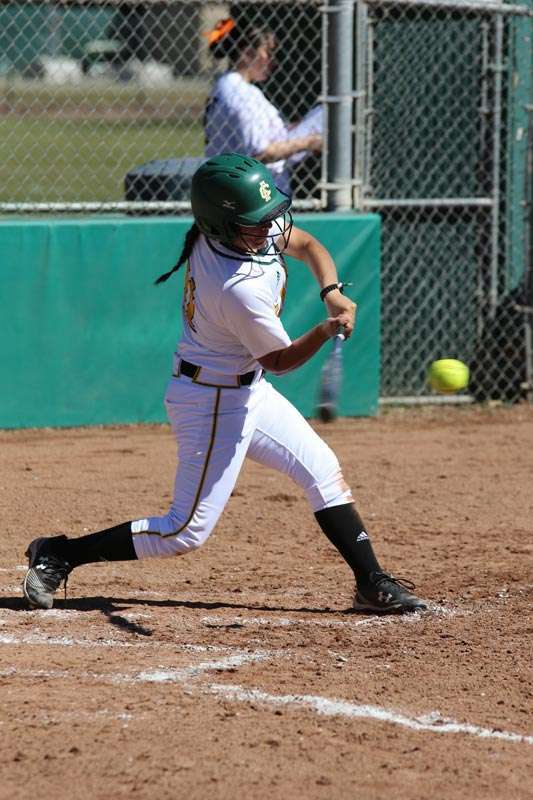 FRC outfielder Bianca Beterano looks lined up for contact! Feather River College women’s softball team has an overall 7-13 record in preseason play, but none of that matters because the ladies are building up a real head of steam as they won four in a row before their first league game March 21 against Butte, winning 7-2 and 2-1 in the doubleheader. 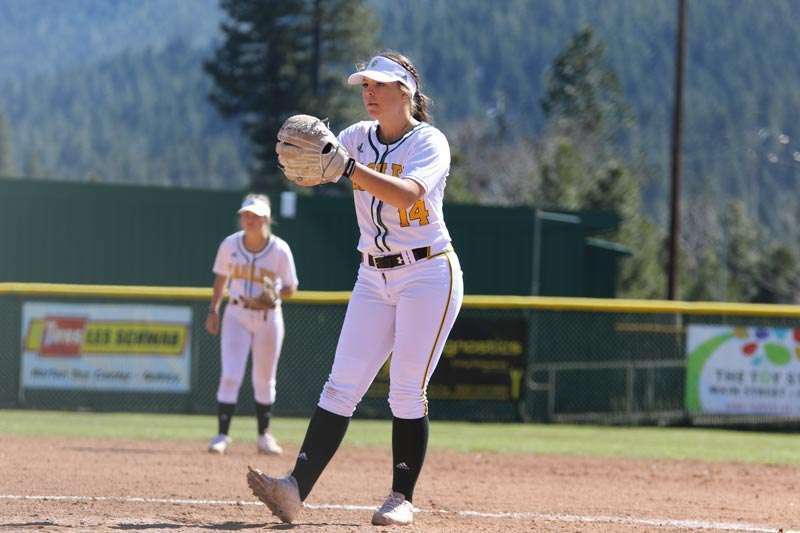 Playing challenging opponents in preseason is an excellent way to strengthen the team and it looks like FRC head softball coach Meredith Aragon and the Butte Roadrunners have been doing just that. The Butte women’s overall record was 4-12 as the two teams met on the field. With 60 runs on the board, the Roadrunners are batting .338, but had lost their last five games in a row. The Eagles increased the losing streak for the Roadrunners to seven games in a row. The Eagles are batting .380 and have scored 117 runs to date. 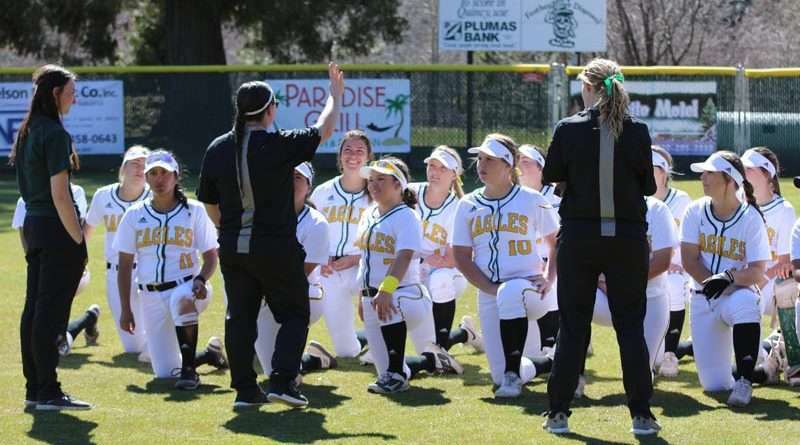 Scoring for the Eagles in the first game were Ananda Delegarito with two runs, Kyllie Sappington, Akela Holder, Madison Harris, Laticia Molina and Alexis Robinson-Howarth, each with a run for FRC. A pair of RBIs were hit by Harris and Cynthia Barela and single RBIs were made by Delegarito, Holder and Bianca Beterano. Delegarito hit a home run and Barela hit a triple. Pitching for the Eagles was up to Delegarito, facing 30 batters, with relief provided from Caitlin Lotspeich. Delegarito struck out nine batters. 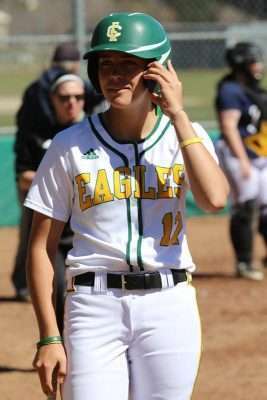 Eagle Madison Harris gets ready to step up to the plate. In game two, both runs for FRC were scored by Kyllie Sappington with RBIs from Holder and Beterano. Lotspeich pitched the whole game facing 32 batters and striking out six. 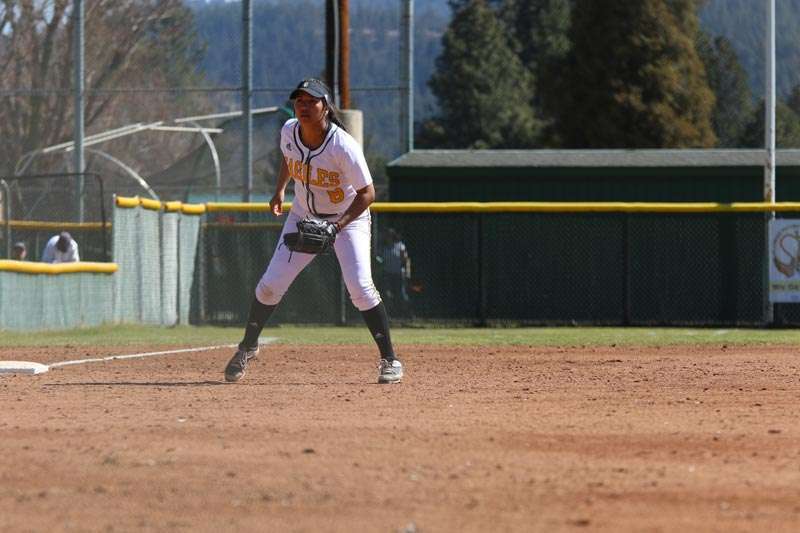 After the Eagles took on the Roadrunners on March 21 they had a doubleheader scheduled March 23 in Lassen, a division match against the Cougars, but it was rained out and will be rescheduled. 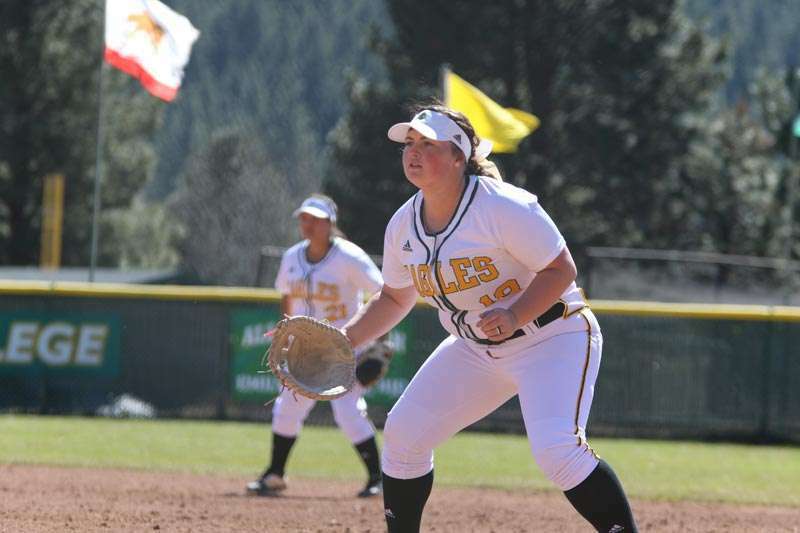 The Eagles take on the Shasta Knights this Friday, March 29, in Weed and will return to the Quincy diamond Saturday, March 30, to host the Redwood Corsairs in a doubleheader on the FRC diamond at noon and 2 p.m.
Rilee Nelson of Sparks focuses, aims and fires over home plate. FRC first baseman Malinna Levesque from Reno is ready for what ever comes her way March 16. Laticia Molina stands ready at third base.